WINTERSVILLE — Forcing turnovers and scoring in transition has been the recipe for success so far this season for the Indian Creek girls’ basketball team. Indian Creek scored the first 17 points of the game against East Liverpool Thursday night, and the Redskins never looked back, en route to a 65-27 victory against the Potters. Indian Creek forced East Liverpool (1-3) into committing 40 turnovers, and the Redskins have forced their opposition into committing 113 overall this season. Offensively, Indian Creek has outscored its opponents 211-70. The 65 points scored is a season low for the Redskins. They have used a balanced scoring attack this season, and a different player has led in scoring in each game. 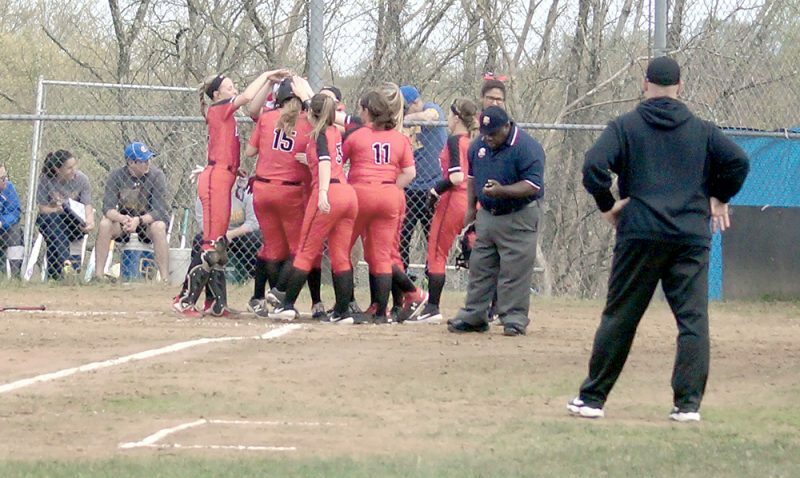 The 17-0 start was two points shy of equaling Indian Creek’s 19-0 start against Edison on Monday. 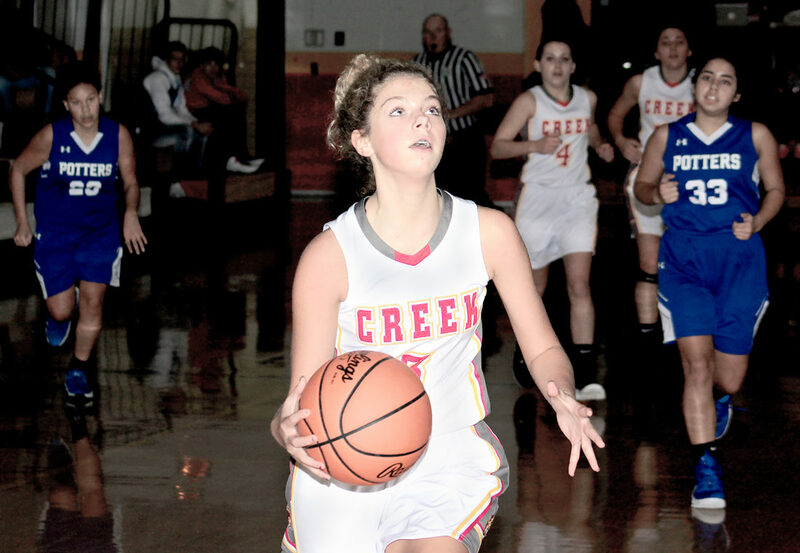 Three players scored in double digits to lead the way for Indian Creek. Kylie Kiger collected a game-high 16 points. Taylor Jones tallied a double-double with 10 points and 11 rebounds. Ally Tweedy delivered 10 points. Mikalya Reed recorded a team-high seven points to lead the way for East Liverpool. Ciara Peachey pulled down 11 rebounds. The Redskins outscored the Potters, 32-4, in the first and fourth quarters combined. Indian Creek led 17-2 at the end of the first quarter, and the Redskins extended their advantage to 38-14 at halftime. The victors led 50-25 entering the fourth. “We want to try to get out in transition,” Eft said. “We need to do a better job of executing in our halfcourt sets — that is for sure. We are a work in progress. The Potters committed turnovers on their first six offensive possessions. The Redskins were at their best when they were able to get out in transition, but they struggled at times against East Liverpool’s zone. Indian Creek is scheduled to play Saturday at Martins Ferry. The JV game is scheduled to start at 3 p.m. Meanwhile, East Liverpool is slated to play against Buckeye Local Monday at Potter Fieldhouse. ≤ Indian Creek won the jayvee game, 33-15. Liz Mazar led the Redskins with 12 points. East Liverpool’s Addison Gaelot had nine. EAST LIVERPOOL (1-3): D. Foster 2 0-0 4; Peachey 0 0-2 0; Reed 2 2-2 7; Ferrazzano 3 0-0 6; S. Foster 0 2-6 2; Ludwig 2 0-0 4; McKinnon 0 0-0 0; Flores 2 0-0 4. TOTALS: 11, 4-10: 27. INDIAN CREEK (3-0): Clark 0 0-0 0; Kiger 7 1-2 16; Tweedy 3 2-2 10; Parrish 0 1-2 1; Taylor 2 2-6 6; Copeland 0 0-1 0; H. Scott 1 0-0 3; Vandeborne 4 0-0 8; Jones 4 2-2 10; Orban 3 0-2 7; T. Scott 1 2-2 4. TOTALS: 25, 10-19: 65. 3-POINT GOALS: East Liverpool 1 (Reed); Indian Creek 5 (Tweedy 2, Kiger, H. Scott; Orban). REBOUNDS: East Liverpool 25 (Peachey 11); Indian Creek 31 (Jones 11). TURNOVERS: East Liverpool 40; Indian Creek 14.